Caldwell, William H 19 Lawrence Co.,Union Twp Butler Co. PA Oct 13, 1844 Sept 9, 1890 New Castle PA not found Per ACWRD, 1864 recruit; wounded at Mine Explosion, Petersburg, VA, July 30, 1864; discharged for wounds (4-14-1865); buried in Greenwood Cemetery, New Castle, PA.
Cameron, Laughlin M 27 not found Per ACWRD, Feb 1865 subsitute, mustered out with regiment July 24, 1865. Campbell, Henry S. C 19 farmer Aug 29, 1862 Bull Run VA not found killed in action. Campbell, James C. C 26 farmer Butler Co., pA Nov 15, 1835 23-Aug-1916 Auburn WA X 134862216 On 8/31/1861 he mustered into "C" Co.
Campbell, Milt'n C. E 22 dark 5' 10" brown brown farmer Butler Co. Mercer Co. PA May 12, 1864 Spottsylvania CH VA X 3254612 1864 recruit, Killed at Spottsylvania CH, brother-in-law of Col. Norman J. Maxwell, last commander of Roundheads. Campbell, Sam'l B. G 20 Mercer Co. PA Jan 1, 1842 Nov 18, 1862? not found Per ACWRD, sick on steamer "West Point" when it sank in the Potomac River Aug 13, 1862; (May have died 6 Dec 62 of disease, May be buried in Grave M-456, Loudon Park Cemty, Baltimore, MD); birth info also by ACWRD. Care, David G 17 March 20, 1865 Petersburg VA not found Last name "Case" per ACWRD; 1865 substitute, died at Petersburg, VA 3-20-1865 (just prior to Fort Stedman). Carey, William K 37 30-Jul-1905 Per ACWRD, March 3, 1865 substitute mustered out with regiment on July 24, 1865; also lived in Graham, MS.
Carmichael, Alfred H 22 October 2, 1862 Per ACWRD, died Oct 2, 1862. Carr, James A. F 18 farmer East Brook, Pa. Lawrence Co. Shenango Twp. PA Lawrence Co, PA Jan 10, 1843 13-Dec-1918 E. Castle PA X X 64030898 fire, gunshot wound, crippled for life; per ACWRD--birth info and buried in Nashannock UP Cemetery, Lawrence Co. PA; genealogy info. Carroll, Marion F 18 grounder East Brook, Pa. Dauphin Co. Harrisburg PA not found Per ACWRD, 1865 substitute, wounded at Fort Stedman, March 25, 1865. Cary, Joseph M 20 not found Per ACWRD, March 3, 1865 substitute mustered out with regiment on July 24, 1865; absent (sick) at muster-out. Cassiday, John M 18 not found 1864 Recruit--no other information found. Cathcart, James F 26 Clearfield Co., Knox Twp PA April 23, 1829 July 27, 1884 Clearfield Co PA not found 1865 Recruit--no other information found. 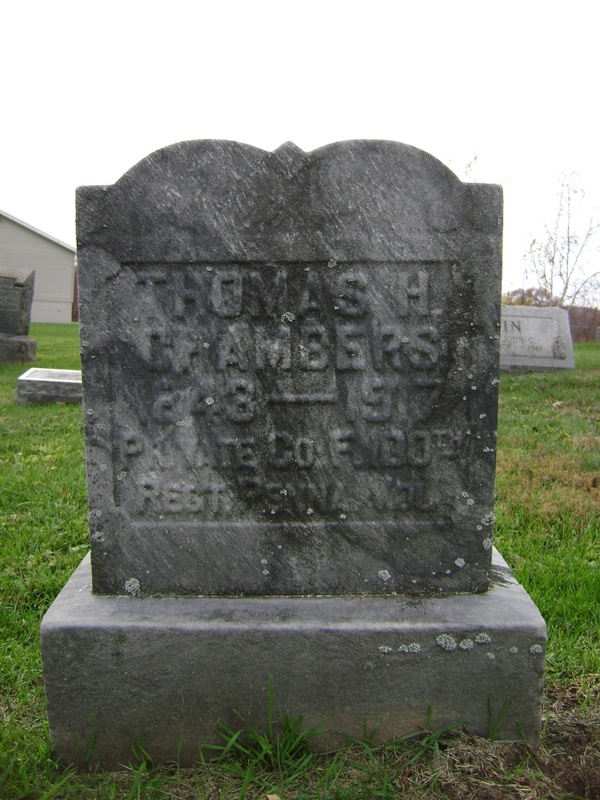 Cearfass, Andrew D 21 dark 5' 8" grey dark laborer Pa. Dec 12, 1845 Jan 27, 1865 Lawrence Co. PA X 43335397 Per ACWRD, died in hospital. Cearfass, George W. D 25 dark blue dark shoemaker Ohio 1838 June 10, 1864 Arlington Nat Cem DC X 8778721 died of wounds rec at Spottsylvania CH May 12, 1864, per ACWRD born in Darlington, PA, "Cearfuss" on gravestone. 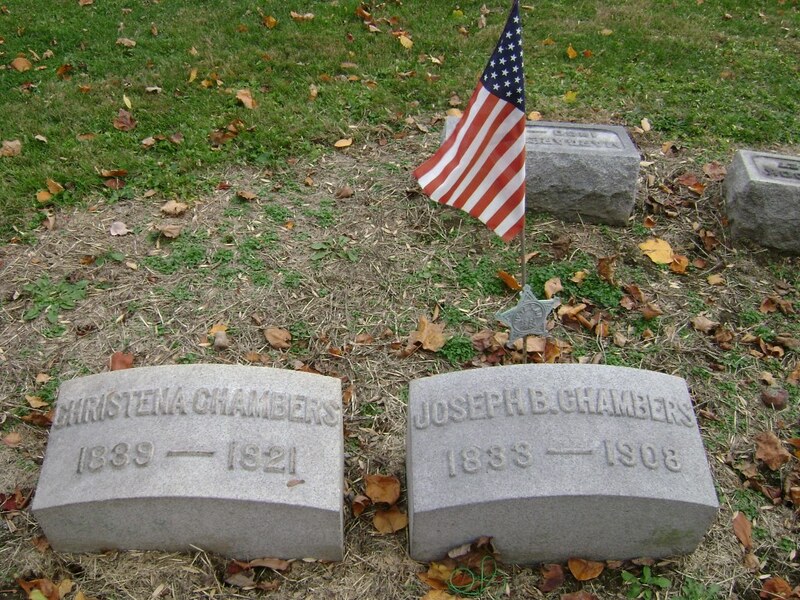 Chambers, Jos. B. F 31 light 5' 9" blue brown mason New Castle, Pa. Lawrence Co. Hickory Twp PA Beaver Co. PA May 4, 1833 8-Oct-1908 Eastbrook (Lawrence Co.) PA X 5858479 X Medal of Honor Winner gunshot wound right arm suffered at Fort Stedman, March 25, 1865. Chapins, Thomas H 20 Nov 17, 1843 27-Jan-20 New Wilmington PA 138417125 1864 recruit; transferred to Veteran Reserve Corps Jan 1865, lived in New Castle. Chesnut, James M 18 20-Nov-1917 Scranton PA X 138417645 Per ACWRD, Jan 1865 substitute mustered out with regiment July 24, 1865. Christy, James H. H 22 16059980 1861 recruit, died in Allegheny City. Christy, Marquis C. C 19 farmer Trumbull Co., Kinsman OH Plaingrove, PA April 24, 1844 22-Feb-1927 Youngstown, Kinsman OH not found Lived in Buffalo NY for a time. "Marcus"? Clark, James W. K 17 15-Dec-1930 Ventnor NJ not found Per ACWRD, after the war lived in Atlantic City, NJ; discharged by special order on 2-27-1864 and on 2-29-1864 he was mustered into US General Army Service, served as clerk in AG office, credit to Attleboro, MA, mustered out Oct 31, 1866; also lived in Idaho Springs, ; ACWRD death date listed as Nov 25, 1930. Clark, Thomas G 18 Dec 12, 1861 Beaufort SC not found died of congestive fever. Clark, Thomas K 43 March 19, 1887 Fulton Co. PA not found buried in Pleasant Grove Christian Cem. Clark, William F. B 29 dark 6' dark dark lab. Pulaksi, Pa. Lawrence Co. PA 1893 not found Had smallpox when home on furlough; per ACWRD. Clark, Wm. A. Jr. B 18 X PA May 12, 1864 Spottsylvania CH VA not found Killed 5-12-64 in action, at Spottsylvania Court House, Va.
Clawson, Richard K 18 not found Per ACWRD, Feb 11, 1864 substitute mustered out July 24, 1864 with rest of regiment. Clay, George K 25 July 8, 1895 Bourbon MO not found Per ACWRD, March 6, 1865 substitute mustered out with regiment on July 24, 1865. Clements, John A 21 June 17, 1864 Petersburg VA not found No other info per ACWRD. Clifft, Henry Unacc not found March 1864 recruit, unassigned. Cline, Isaac K 26 Allegheny Co., Allegheny PA New Jersey 14-Aug-1906 Erie PA X 7885668 "Commissary Sgt" per 1890 census info, died while residing at Soldiers and Sailors Home. Cline, John W.. K 20 dark? 5' 7" hazel laborer Lawrence Co., New Castle PA Glassboro, NJ April 12, 1844 20-Oct-1925 New Castle PA X 16055200 Per ACWRD, buried in Graceland Cemetery, New Castle, PA; after the war lived on Sampson Street; conflicting information on whether he died in 1925 or 1927--gravestone shows 1927 but looks like a replacement stone. 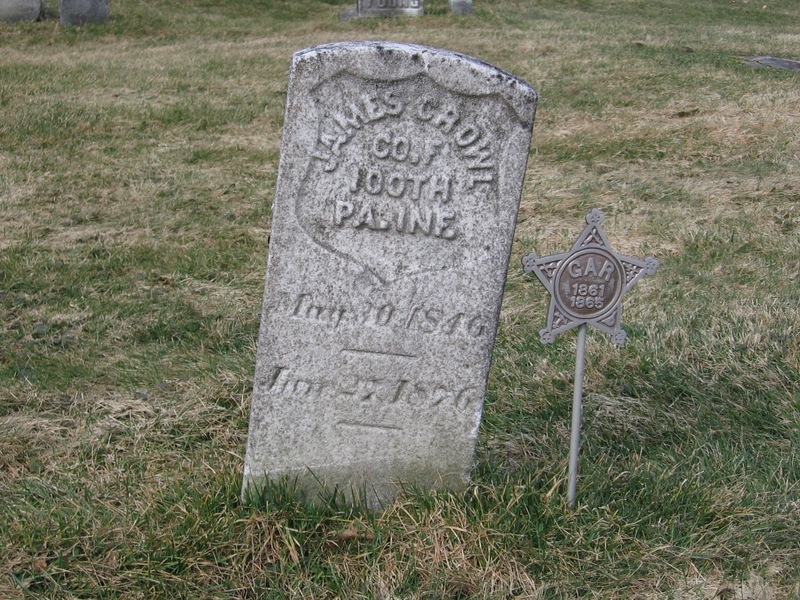 Cluise, Joseph F 18 dark 5' 7" brown brown farmer East Brook, Pa. Jan 9, 1846 30-May-1927 McLuney OH X 59566113 Per ACWRD, wounded at Fort Stedman, 3-25-1865; 1864 recruit--confident findagrave information is same individual based on location of cemetery (New Lexington) at McLuney, OH and age at enlistment matching birth year; last name may be "Cluse"; possible date of burial June 1, 1927. Coddie, John D 22 fair 5' 3" blue brown miner Great Britain not found Per ACWRD, not even in the roster. Possible correspondent? Connelly, John N. G 18 Dec 6, 1863 Knoxville TN not found Per ACWRD, wounded at Fort Saunders, TN outside of Knoxville on 11-29-1863, wounded in leg, amputated and died a week later. Conner, John H 18 not found Per ACWRD, March 9, 1865 substitute deserted on March 18, 1865. Conrad, Absalom K 46 1868? 49169904 Per ACWRD, Feb 7, 1865 substitute, mustered out with regiment July 24, 1865. Findagrave info would have to be investigated--not a common name so possible match. Cook, James I 30 Mercer Co. PA Sept 18, 1838 April 27, 1890 Muncie IN not found Birth and death date and locations per ACWRD. Cook, Joseph D 22 farmer Darlington, PA 1840 12-Feb-1928 San Francisco CA X 27849272 Per ACWRD, POW on 6-2-1862--place not stated, also birth year and place; lived in Paola, KS in 1878, also lived in Albany, OR. Findagrave listing needs to be confirmed but suspect same based on birth and death year and tie to OR. Cooley, Albert K 40 not found No other information found. Cooley, Edmund E 19 not found Transferred to Company K, no other information available. Cooney, John W. H 18 Perry Co., Madison Twp 8-Jan-1925 Andersonburg PA not found Per ACWRD, March 7, 1865 substitute, mustered out with regiment July 24, 1865. Cooney, William K 19 not found Per ACWRD, March 7, 1865 substitute, mustered out with regiment July 24, 1865. Corbin, Wescott G 18 1847 April 4, 1899 not found Per ACWRD, January 1865 substitute mustered out with regiment July 24, 1865. Correll, William B 22 not found Per ACWRD, March 10, 1865 Substitute--mustered out with regiment July 24,1865. Corsnitz, William G 44 not found Per ACWRD, Feb 1865 draftee--mustered out with regiment July 24, 1865. 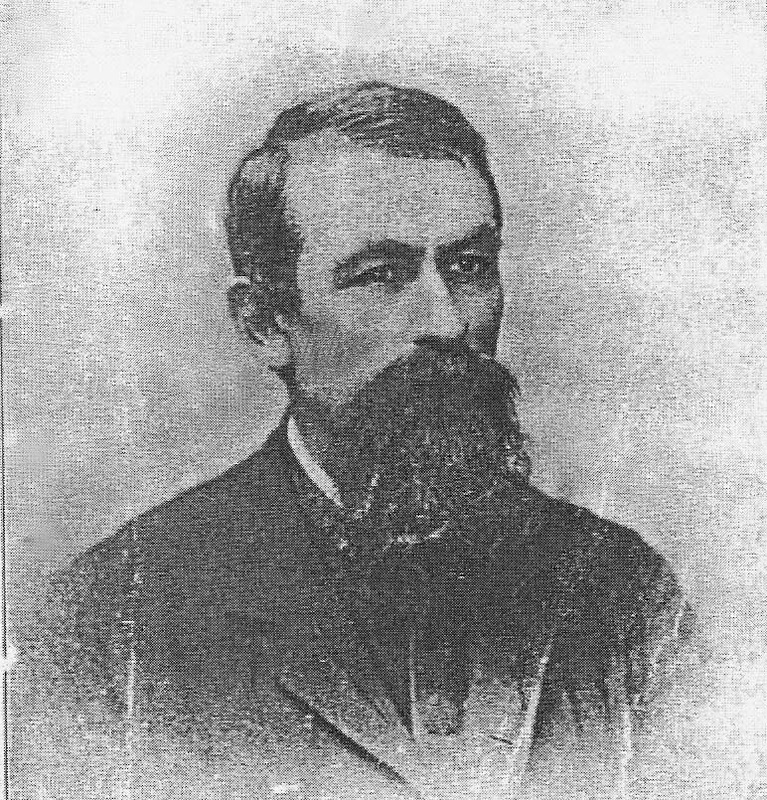 Courtney, John C. D 21 light 5' 8" blue light blacksmith Prussia September 8, 1845 15-Nov-1913 Dayton OH 528801 Per ACWRD, listed as wounded May 5, 1864 at Wilderness, birth date and location of Darlington, PA conflicts with "Prussia"
Cowan, William M 23 not found Per ACWRD, Feb 13, 1865 substitute--deserted June 17, 1865. Cox, John M 30 Westmoreland Co. Rostraver Twp. 9-Jul-1902 Webster PA not found wounded left thigh and left shoulder. Cozad, William J. 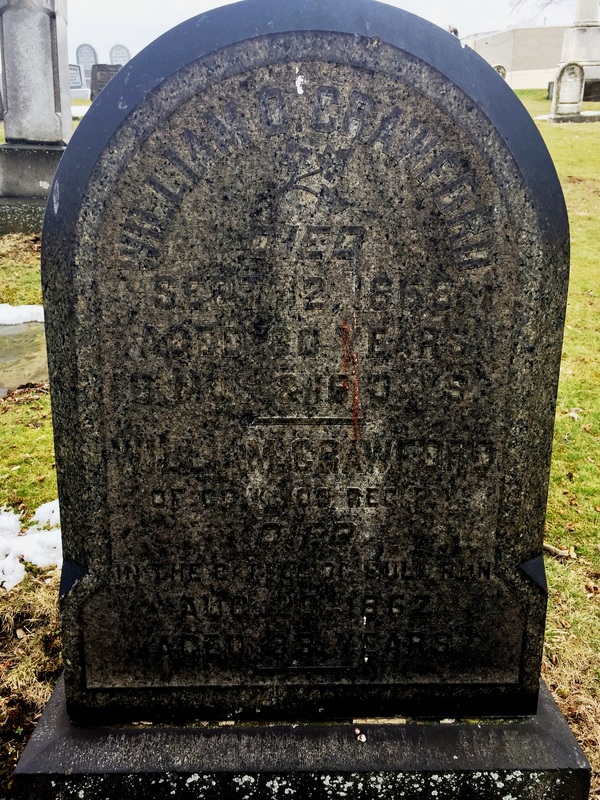 D 25 dark 5' 7 1/2" grey light laborer Trumbull Co. Hubbard OH 17-Mar-1916 Sharon PA not found Per ACWRD, mustered out July 24, 1865--sick at muster out. Cramer, Corbin K 19 June 23, 1847 July 23, 1890 OH not found Per ACWRD, March 9, 1865 substitute mustered out with regiment on July 24, 1865. Crawford, Robert S. G 25 Sept 25, 1864 Washington (Nat Cem) DC X 34841227 Per ACWRD, He died of disease on 9/25/1864 at Washington, DC; Buried: Arlington National Cemetery, Arlington, VA; Gravesite: 13-8534. Cregan, Patrick M 27 Allegheny Co., Ocean MD after 1890 not found Per ACWRD, 1861 recruit that deserted December 9, 1862. Creighton, Joseph D. B 21 dark 5' 10" blue dark farmer Lack. Twp. Pa. Pa. Aug 19, 1864 Weldon RR VA not found Killed 8-19-64 in action at Weldon Railroad, Va.
Crooks, John M 28 Tyrone, Ireland Dec 21. 1828 Dec 30, 1891 Elba MN not found Birth and death dates/locations per ACWRD. Crowel, John D 30 dark 5' 7" hazel dark carpenter Aug 19, 1864 Poplar Grove Nat Cem VA X 8699018 Per ACWRD, killed at Weldon Railroad; Grave--division A, Section A, Grave 9; listed as "Crow" on gravestone. Crowl, Mathias F 18 Nov 22, 1861 Hilton Head SC not found Per ACWRD, died of dysentery. Crowser, Lewis K 18 25-Sep-1914 Wernersville PA not found No other information found. Aug 13, 1862; findagrave info may be a match but more research needed to confirm. Culberson, Robert D 22 farmer Aug 13, 1862 Potomac River--Drowned VA not found No other information found. Curley, John F 29 9-Jan-1916 Atlantic City NJ 65322521 Jan 1865 Substitute--mustered out with regiment in July 1865; possibly John P. Curley died in 1898, born in 1838. findagrave info indicates burial in Pleasantville, Atlantic City, NJ. Curran, Michael A 34 July 30, 1864 Petersburg VA not found died of wounds rec at Battle of Crater. Curry, John M 28 Allegeheny Co., Elizabeth after 1890 not found No other information found.